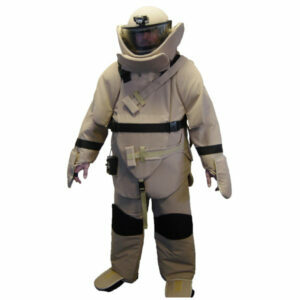 Complete EOD/IEDD ensemble provides highest levels of protection against fragmentation, overpressure, impact and heat. The Olympia Bomb Suit is a complete EOD ensemble comprising trousers; jacket with sleeves and collar, three part (neck, chest and groin) blast plates; hand mitts; over boots; helmet with visor, comfort liner, search light, ventilation/demister and integral communications; air blower, cooling suit, hardwire or wireless communication system, back protector and carry bags. The suit is constructed from Nomex® Delta T, ripstop, certified flame retardant material which is available in a selection of colours. Other materials are available on request. The zonal armour system provides optimum protection with maximum flexibility and comfort. The highest protection level is afforded to life critical areas of the body with V50 ranging up to 1,900 m/sec. These levels of protection can be adjusted to suit individual client needs.